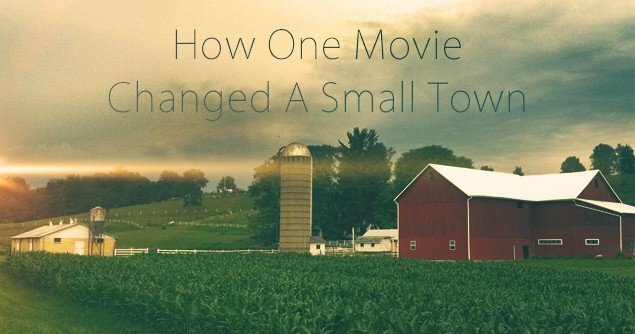 The Village of Sugarcreek is not perfect, but in reality, it is very nearly as sweet and lovely as it is portrayed in the movie. The people–perhaps because of the predominance of Amish and Mennonite families–are especially decent and kind. When I drove into that town five years ago, trying to research my first published book, I didn’t have a big name as an author. I didn’t have much credibility at all. But much like my movie hero, Joe, the people took me in, taught me about their culture, and encouraged me in spite of the fact that I was a complete stranger to them. There are a lot of tourism dollars spent in Ohio Amish country, but Sugarcreek was a little off the main path. They didn’t seem to attract the tourists like some of the larger towns and the shop keepers were struggling. The owners of a beautiful little family-run Christian bookstore were very worried. Business had gone downhill for several years in spite of their hard work. They didn’t know if they could continue to stay open if things continued to trend downward. The store had been started by their father and had been in existence for nearly fifty years. They didn’t want to lose it. And then Mission Pictures moved into town for a few weeks to film a movie, and things started to look up. The actors, director, and crew were astonished at how welcoming and kind the local people were. Mission’s main office was practically next-door to the Gospel Bookstore, and suddenly more people were coming in, mainly to buy the book because they were curious about the movie–but they would also look around while they were in there and buy a couple other books. The proprietors were smiling more than I’d seen them smile in years. They talked excitedly about the day when there would be a DVD to sell, too! And that brings us up to last night. There was a huge community event here. Sugarcreek Village hired a company to set up a drive-in movie to help them celebrate. The place was packed with cars and people sitting in lawn chairs and on blankets. Children were everywhere. The weather was perfect. It was even free, which everyone appreciated. Few people in this area have the UP network, so it was the first time most had watched it. For two hours before the movie started, I did a book signing along with the two actors who played Aunt Anna and Aunt Lydia, who have become friends of mine. The book signing was a solid stream of people all excited about the movie. They loved especially getting to meet two of the main actors. But here’s the best part. Many of the people were local business owners who have already begun to see an uptick in their businesses because of the new surge of tourists. The mayor told me that he’d already had people as far away as Utah come visit because they’d seen the movie, which only aired two weeks ago. It was no small thing to be getting hugs from so many grateful, decent, hard-working people. I have to admit, I’ve been one of those people who didn’t pay a lot of attention to what happened on the screen. I seldom went to movies. Our family went without a television in our home for many years because I didn’t like what some of the programs taught my kids. Instead, I read books and wrote. The first I saw the possibility for the good a movie could do was at the class you taught at ACFW last fall when you looked at all of us and told us, “If your goal is to become best selling authors, you are aiming too low. Your Christian books are fine as long as someone actually picks them up and reads them. But if you want to change the culture, you have to become involved in movies. Those words were in my head last night as I stood on a hill and marveled over all the cars and people and children and blankets and picnic baskets as they experienced a gorgeous movie that managed to entertain and still honor God–a movie that held everyone’s attention without the use of even one curse word. I experienced a moment of such sheer, pure joy; it is impossible to describe. All these children and parents relaxing, talking with neighbors, enjoying a lovely evening together. An entire town experiencing a renewal of hope. And THAT is what can be accomplished when seasoned Hollywood professionals put their minds to it. Hollywood has such enormous power for good it is absolutely mind boggling. Serena Miller took part in Movieguide®’s HOW TO SUCCEED IN HOLLYWOOD (WITHOUT LOSING YOUR SOUL) class. For information about this class, please email nikki@movieguide.org.